at the 2001 Ride for the Roses. Blind tandem racer Cara Dunne-Yates posted track speeds last spring that earned her a spot on the U.S. team that competed in October at the 2000 Paralympic Games in Sydney, Australia. And in Sydney, she and partner Scott Evans were riding as fast as they had in the 1996 Paralympics in Atlanta, where they won a silver medal in the kilo and a bronze in the 200-meter sprint. But the level of competition had been kicked up a notch. "I just wasn't feeling like I had that magic in my body that I used to have. I couldn't put my finger on it," Dunne-Yates said. She'd had a baby in January 2000, and nursed through the summer while living in Colorado Springs, Colo., and training at the Olympic Training Center there, "and I thought I was just tired." Then, in Sydney, she felt a lump in her abdomen. Back home, medical tests ensued, and on Dec. 26 she had surgery to remove a cancerous tumor. It was a sarcoma. Dunne-Yates, 31, had survived two cancers already. She lost her eyesight at age 5 to retinal cancer. A related bone cancer in her face eight years ago cut short a ski racing career that included three silver and two bronze medals at the Paralympics in 1984 and 1998. In between the two cancers, she graduated from Harvard College, and after the second cancer she earned a law degree from UCLA, where she got into bike racing. With the latest diagnosis, she was on a plane to Boston within a week to see her sarcoma specialist at Massachusetts General Hospital. Now Dunne-Yates is undergoing chemotherapy at Mass. General and living with the Laborde family in Oakham, along with her husband, Spencer Yates, and their daughter, Elise. Yates is a competitive cyclist and former ski racer, too. He and met Dunne at the U.S. Paralympic Trials in 1996, when he was piloting blind cyclist Matt King, and they got married in 1998. This month, complications landed Dunne-Yates in the hospital in Worcester for six days. Regaining her strength last week at UMass Memorial Medical Center/ University Campus, she reflected on past and future challenges, on and off the bike. Part of the emotional turmoil in Sydney was watching U.S. riders Pam Fernandes and Al Whaley win a gold medal in Dunne-Yates' best event, the mixed tandem kilo. Of course Dunne-Yates was pleased for her teammates, but it's no secret that on the track she and Fernandes are fierce rivals. Fernandes, 39, who lives in Needham, has been blind since age 21 from diabetes. Her gold-medal performance in Sydney came despite breaking her foot 10 days before the race, and set a world record for the kilo. Fernandes and Whaley also won a silver medal in the sprint. "Pam and I both have these really wild medical recovery stories, and we have similar challenges, being blind," Dunne-Yates said. "I learned a lot from Pam. She's been racing longer than I have. But you can't help having some tensions there. You know, we're not just competing for results. We're competing for attention, we're competing for money, even sometimes competing for partners." 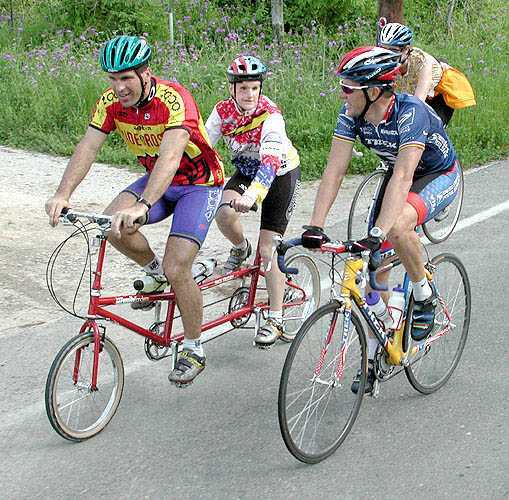 Tensions between the two blind stokers came to a head at the 1998 World Cycling Championships for the Disabled in Colorado Springs. Their qualifying times pitted the two against each other in the sprint quarterfinals. Evans maintained that cycling etiquette called for Fernandes and her pilot, Kenney Williams, to forfeit at the starting line, allowing their teammates with a better qualifying time to advance to the semifinals and a chance at a bronze medal without expending precious energy in the heats. Instead, it was agreed that the two pairs would race, but Fernandes and Williams would let Dunne-Yates and Evans win. That's what happened, but Dunne-Yates felt that Fernandes and Williams raced too hard. She said they only backed off in the final seconds, unnecessarily tiring Dunne-Yates and Evans, who then lost in the semifinals. Ultimately, Dunne-Yates put aside any hard feelings in favor of teamwork. "In Sydney, Scott and I felt like, 'Why should we help them?' But we did; we worked really hard to work their rivals, wear them out. And they thanked us, and it all ended up good," Dunne-Yates said. Fernandes said she respects and admires Dunne-Yates for her strength and focus, and any rivalry between the two is only on the track. "I'm hoping she can take this competitive streak of hers and apply it to fighting this disease," Fernandes said. "And if I know Cara ... she'll come out a winner." Three weeks ago in Austin, Texas, Dunne-Yates received the Carpe Diem Award for "the spirit of survivorship" at a fund-raiser for the Lance Armstrong Foundation. For part of the Ride for the Roses, she and her husband were spinning on a foldable tandem alongside Armstrong, two-time Tour de France winner and a cancer survivor himself. Armstrong said to them, "Sure have to hand it to you guys for riding tandems on tracks." On June 23, the Institute for International Sport will induct Dunne-Yates into its International Scholar-Athlete Hall of Fame, in a ceremony at the University of Rhode Island. She's happy for the chances to remind people that people with disabilities can be true competitors, but "I don't need galas," she said. "Sometimes I just want to be anonymous and nondescript. I'd just be kind of average but there wouldn't be any of this hard stuff." As for the future, Dunne-Yates wants to write her autobiography, and she could always put that law degree to use. She's not sure whether she'll aim for the elite ranks of cycling again. "While it's fun to race at that level, it's really hard to make a commitment," she said. "I'm looking forward to getting fit again, for health and for the fun of it, and spending time with the baby. I could be happy with weekend races, I really could -- for a while." She figures she's young enough that her options are open, should the competitive itch resurface. "Look, Pam's 40," she said. "But when you deal with these illness things, you're trying to get over one hill first."